It was a memorable visit for the Guides who helped the homeless project while they were in Madagascar. In the second part of a series of articles featuring the life-changing work of TASC Madagascar, the Tossing a Starfish charity, the Ripon Gazette finds out more about TASC’s other projects, including their commitment to tackling homelessness. Over the last 17 years, Ripon City Councillor Stuart Martin has been involved with TASC to help transform the lives of disadvantaged people in Madagascar, and in those 17 years he has often felt very affected by some of the situations that Madagascan people are in - including witnessing first-hand the scale of homelessness. Since 2015 the charity has worked with Feedback Madagascar to tackle homelessness in Fianarantsoa, by helping people into accommodation, education and work. As the project continues, TASC is eager to raise awareness of the issue. Coun Martin said: “At TASC Madagascar we really believe in treating people with dignity, and trying to give them back their own dignity. That is fundamental in everything that we try and do, and it is what we are trying to do with our homeless project. “The Madagascan people are very proud, and I will always remember one of the people in charge of the village saying to me, ‘we don’t want charity, we want to get out of this mess and work our way out of this situation’. “We simply give them a helping hand to find a way out of their situation. It’s about empowering them to take ownership of their lives. If you give someone a fish, you can feed them a day, but if you give them a fishing rod, you feed them for life. “Last year we met a lady living on the streets. She was 98, eating and drinking and living on the streets. Anyone with grandparents, anyone reading this, just imagine it. Nobody deserves that. 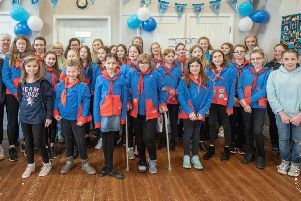 A group from Girlguiding North Yorkshire West County visited Madagascar last year and donated £2,000 to the homeless project. A further £8,000 from the Guides went towards the new schools funded by TASC and The Adsum Foundation. During their trip the Guides also decorated school classrooms, stayed at a twins orphanage, and helped to refurbish a gazebo at the Ambokala mental hospital in Manakara. Coun Martin said: “It was a very emotional trip for the Guides, it definitely affected them and you could see them grow. “I would be very happy to speak to any leader of a group who is interested in doing a similar expedition. “Being involved in TASC is life-changing, it is humble to be able to help people and see their gratitude when we do.